To the casual reader, this might seem like a call to arms or a provocation for military action. Yet I don’t see this as a militant statement, but merely a memory aid to help people remember key items needed to prevail in spiritual conflict, namely: truth, righteousness, sharing the gospel, faith, salvation, and the word of God (the only offensive tool of the group). 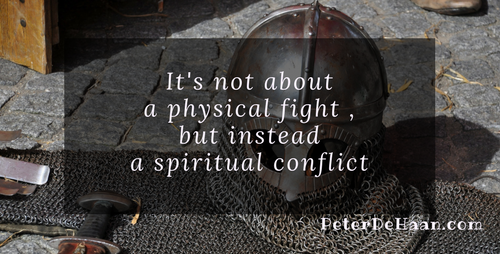 It’s not about a physical fight (which many people have missed throughout the ages), but instead a spiritual conflict for which followers of Jesus must be prepared to engage in using: truth, righteousness, sharing the gospel, faith, salvation, and the Bible. This is what is meant by the metaphor of the armor of God.